On 18 December 1898 Winston Churchill wrote to his friend Aylmer Haldane from a train near Wadi: “I am leaving the army in April. 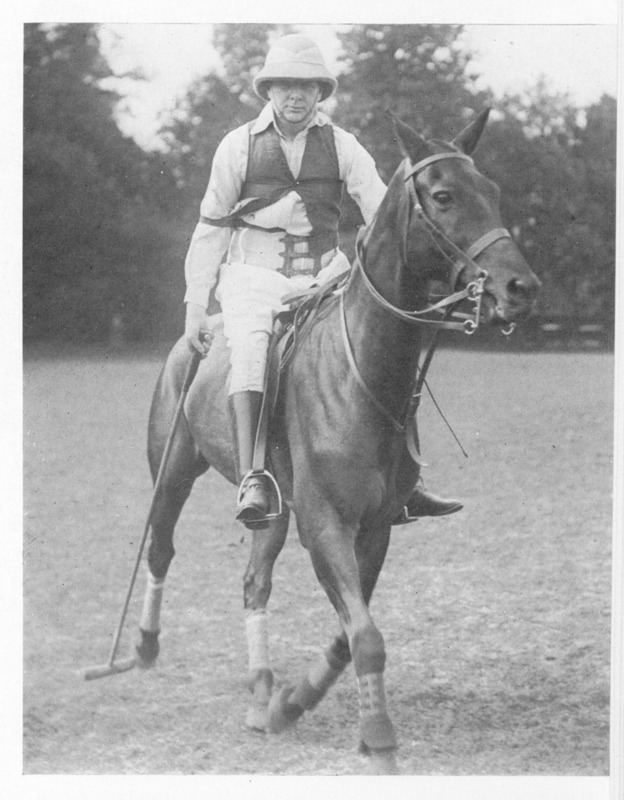 I have come back merely for the Polo Tournaments.”32 In support of this climacteric in his army polo career, Churchill recalled, the officers had subscribed to support a special train to carry their thirty polo ponies 1400 miles. “I shall stay at Government House,” Winston wrote his mother. In his autobiography three decades later, Churchill wrote that he first dislocated his shoulder on arriving in India for the first time in 1896. At the Bombay quayside he had grabbed an iron hand-hold ring when the boat fell with a sudden surge and he wrenched his shoulder. Thereafter, he wrote, he had to play polo with his arm strapped to his side. Even with his arm immobilized, Churchill managed to play well enough that his team beat the 5th Dragoon Guards 16-2, and the 9th Lancers 2-1, in the first round on 23 February. In their final match with the 4th Dragoon Guards the next day, the Hussars won 4-3, making them Inter-Regimental Champions. At Chartwell, which he bought in 1922, Churchill kept polo ponies. Their expensive country house in Kent was often the subject of financial “discussions” between Winston and Clementine. Afterwards, Winston would embark on a well-meant but only briefly kept economy program. 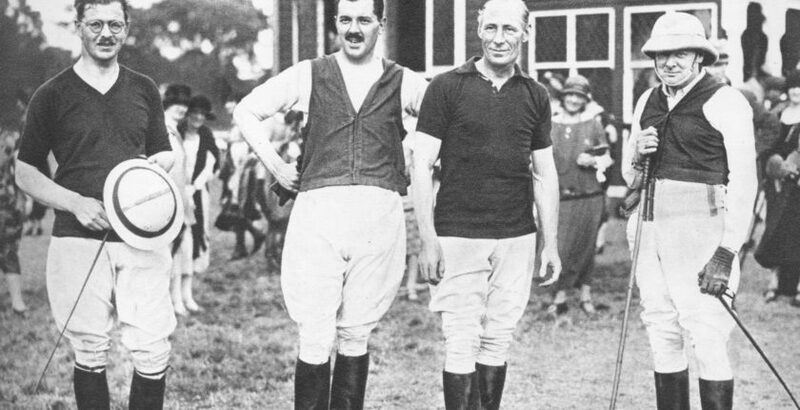 During one of these, in 1926, he suggested that Chartwell be rented while they were in London, and that all livestock—except the two polo ponies—be sold.47 The ponies were still sacred! 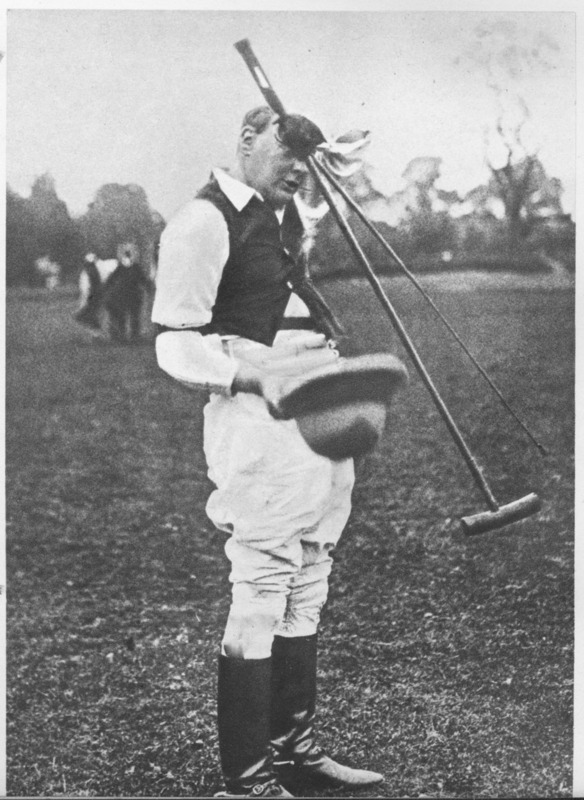 Many photographs exist of the mature Churchill at play, always with his right arm strapped to his side.48 He wipes his brow after a chukka at Roehampton (12 March 1921), takes a drink during a break in a Lords versus Commons match (June 1922). A famous photo shows him playing with the Prince of Wales in 1924. A group picture taken on 18 June 1925 shows WSC with fellow players Capt. G.R.G. Shaw, Captain Euan Wallace and Captain the Hon. Freddie Guest, after Churchill’s Commons team defeated the House of Lords. Winston and Clementine are seen arriving at Hurlingham the same year, to watch the British Army play polo against an American team. Taken at a gallop, he must have reasoned, and would later write in My Early Life, it would be a very good death to die…. 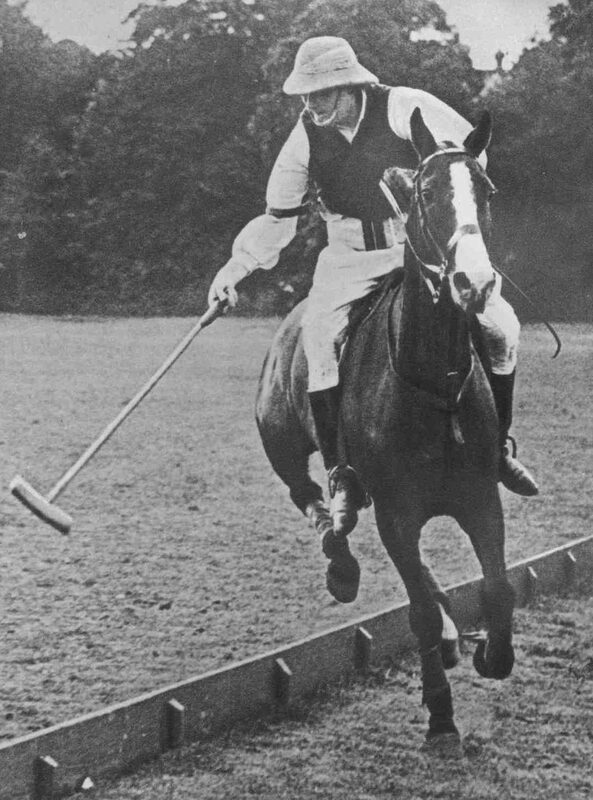 At age 52, that was the last recorded occasion when Winston Churchill played polo. Barbara F. Langworth is a New Hampshire publisher and editor. 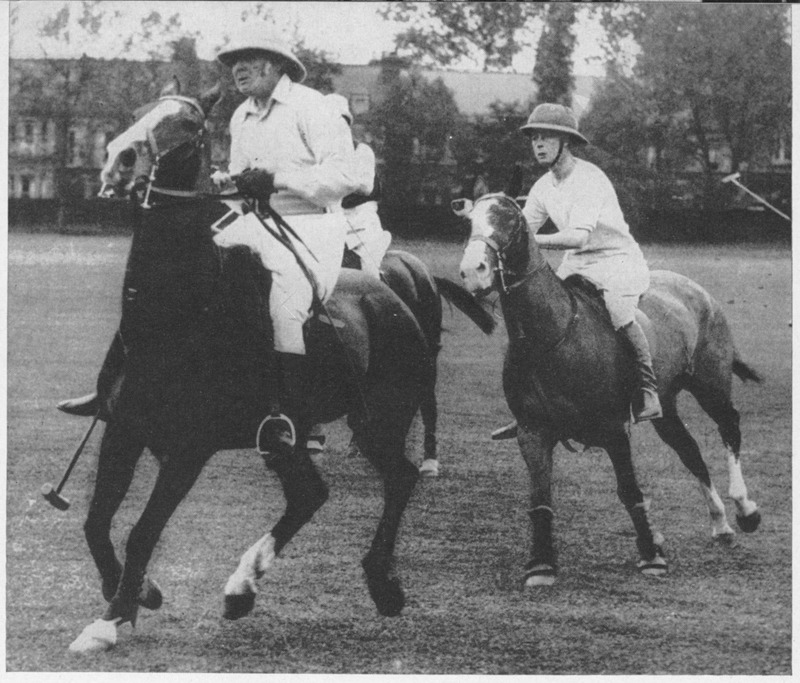 “Churchill and Polo” was first published in 1991. This updated, amended version is published by kind permission of the author in response to reader requests for more information on Churchill’s favorite team sport. The article incidentally demonstrates the rich store of material available in The Churchill Documents, published by Hillsdale College Press. 32 Randolph S. Churchill, ed., The Churchill Documents, vol. 2, Young Soldier 1896-1901 (Hillsdale, Mich.: Hillsdale College Press, 2006), 995. 37 Winston S. Churchill, My Early Life (London: Thornton Butterworth, 1930), 116. My thanks to the late Lady Soames, and to Paul Courtenay and Andrew Roberts, for researching both shoulder dislocations and helping me arrive at the correct sequence of events. 39 Randolph S. Churchill, ed., The Churchill Documents, vol. 3, Early Years in Politics 1901-1907 (Hillsdale, Mich.: Hillsdale College Press, 2007), 48. 44 Randolph S. Churchill, ed., The Churchill Documents, vol. 5, At the Admiralty 1911-1915 (Hillsdale, Mich.: Hillsdale College Press, 2007), 1986. 45 Mary Soames, Clementine Churchill (Boston: Houghton Mifflin, 1979, 268. 46 Martin Gilbert, Churchill: A Life (London: Heinemann, 1991), 439. 47 Richard Hough, Winston & Clementine: The Triumph of the Churchills (London: Bantam Press,1990), 406. 48 See for example Randolph S. Churchill and Helmut Gernsheim, eds., Churchill: His Life in Photographs (New York: Rinehart, 1955), 99, 100, 115, 116. 49 Cecil Aspinall-Oglander, Roger Keyes (London: The Hogarth Press, 1951), 78. 51 Ibid., 886. In English polo, a 2 handicap is low on the scale of -2 to 10, handicaps below 0 being novice levels.